Programmable Dispenser suits battery manufacturing. Integrating CeramPumpÂ® design with programmable stepper motor control,Â Model PDS-100 dispenses and meters electrolytes, slurries, and metal forming lubricants used in manufacture of AA, AAA, C, D, and button cell batteries. Pump electronics are housed in anodized aluminum enclosure suitable for desktop or wall mounting. Available in single and dual pump head configurations, PDS-100 will dispense 2Â ÂµL to 1Â L per minute continuous metering while maintaining 0.5% precision for millions of dispenses. Fluid Metering, Inc., Syosset, NY introduces the new PDS-100 Programmable Dispenser for battery manufacturing process applications requiring precision, maintenance-free fluid control. The PDS-100 is designed for dispensing and metering electrolytes, slurries, and metal forming lubricants used in the manufacture of AA, AAA, C, D, and button cell batteries. The PDS-100 integrates FMI’s patented CeramPump® design with precision programmable stepper motor control. The pump electronics are housed in a rugged anodized aluminum enclosure suitable for desktop or wall mounting and features intuitive front panel programming of dispense and continuous metering modes. The PDS-100 is available in both single and dual pump head configurations. For duplex configurations, the displacement and speed of each pump head can be individually controlled, ideal for proportional mixing and diluting. Duplex configurations can also provide economic 2-channel dispensing, effectively doubling production capacity at a fraction of the cost of using two individual dispensers. 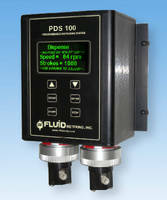 The PDS-100 utilizes Fluid Metering’s patented CeramPump® pumping principle. One moving part, a rotating and reciprocating ceramic piston, accomplishes all fluid control functions in the pump, thereby eliminating check valves and their associated failure and maintenance issues. It will dispense from 2 microliters up to 1 liter per minute continuous metering, while maintaining a precision of 0.5% for millions of dispenses without re-calibration or downtime. For over 55 years FMI pumps have been used for industrial automation, medical instrumentation, laboratory R&D, chemical process, pharmaceutical packaging, mining, alternative energy, water treatment, environmental monitoring, food processing and much more.